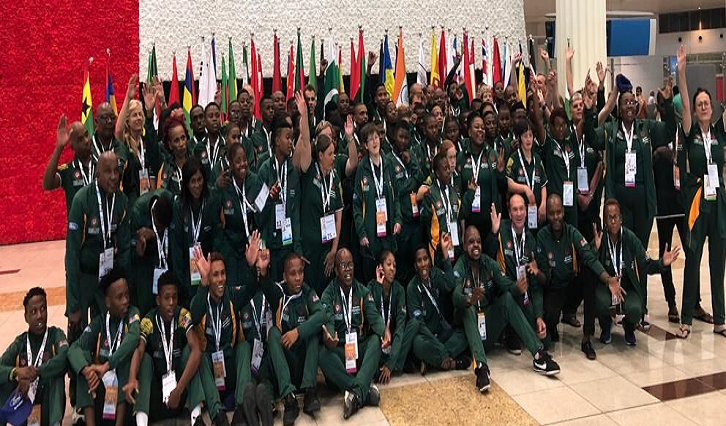 The South African Special Olympics team has returned to South Africa from Abu Dhabi where they participated in the Special Olympics World games. And they didn’t come home empty handed. Team South Africa won 59 medals in total 4 gold medals, 12 silver and 12 bronze. It was a job well done by Team South Africa. And hundreds of well wishers gathered at OR Tambo International to welcome them home unfortunately no-one from government. The Chairman of Special Olympics South Africa, Mathews Phosa, was there to welcome home his athletes and he was a very proud man. Phosa said these athletes and their achievements should be celebrated. Family members and teachers were over the moon. Thandiwe Pringle, from Matshediso Lsen School in Tsakane, promised to bring back a medal when the team left for Abu Dhabi. And true to her word, she won a Gold medal in golf. “I’ve been longing to see them; I was away from them for almost two week, that’s long. I want to bond with them and celebrate my victory,” says a gold medalist, Thandiwe Pringle. Tears of joy were shared by teachers, coaches, as well as family members. The post Team SA Special Olympics returns home with 59 medals appeared first on SABC News – Breaking news, special reports, world, business, sport coverage of all South African current events. Africa's news leader..